The canning continues . . .
Today I got out Big Bertha, my All American pressure canner. I don’t always use a pressure canner when canning tomato sauces, but the tomato soup recipe I was canning today had a few ingredients that aren’t on my usual list so I thought I should be on the safe side and use the pressure canner. As you would expect, Big Bertha is a heavy beast. I admit to being a bit intimidated by her, but I’m becoming more confident using her and she really is an impressive contraption. The pint jars on the right are spaghetti sauce. I water bath canned these, adding a bit of lemon juice to each jar to make sure they would have enough acidity so that water bath canning would be safe. The jars on the left are the tomato soup jars. I used the recipe from Susy at Chiot’s Run. Susy does not typically pressure can this recipe, but I am a bit of a canning wimp and decided to use the pressure canner. I hadn’t used Big Bertha this canning season yet anyway, so it gave me a good reason to get her out and gain more experience with the pressure canner. Everything turned out great! Thanks for sharing your recipe Susy. 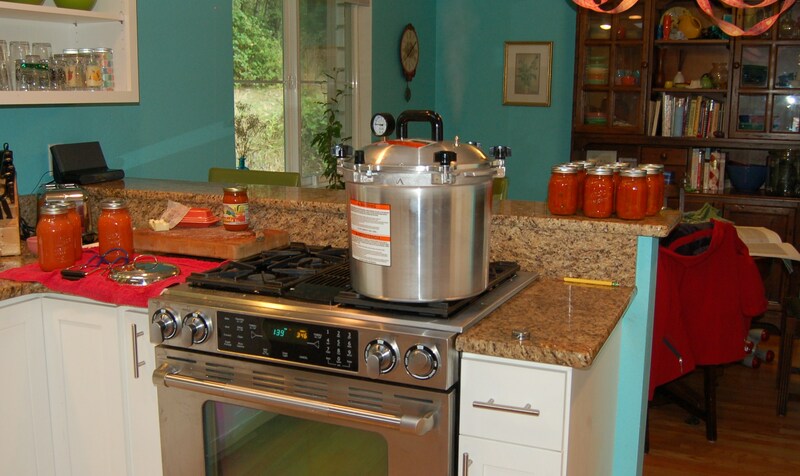 This entry was posted in Cooking & food preservation and tagged pressure canner, spaghetti sauce, tomato soup, tomatoes. Bookmark the permalink. 11 Responses to The canning continues . . .
Glad you were able to use the recipe. I’m a bit old-school when it comes to canning. I prefer using the old canning guidelines as I feel like I’m cooking everything into oblivion with the new rules. Plus I don’t have a pressure canner so I have waterbath. The recipe is really nice. Thanks again. The stove is pretty, but it is a total dog. Because of how our kitchen is configured we needed a gas/electric combo with a downdraft. There is only one model available: a Jenn-Air. The computer panel has died twice in the last six months and it is a total pain to fix. The stove is only a few years old. I used to have a Wolf that we liked much better (and it had bigger flames) but that had to go with the kitchen remodel. one…*: ( It is a ceramic top electric and I’m afraid “Bertha” would crack the top…*: ( I haven’t had enough to can really so my dehydrator is sufficient. I just set up my first fall garden and will be experimenting with several new crops…snow peas and cucumbers. I can grow squash, tomatoes and jalapenos successfully as well as herbs and purslane. I think I will just try my hand at lacto-fermentation until I find out if I can actually use a pressure canner on my range top. Your pictures are quite inspiring! I have yet to use my pressure canner this year, but it is a great thing to have when the garden is ultra prolific with low acid items. The tomato sauce and soup looks really good! I did four pints of tomato sauce this weekend as well – that’s all the tomatoes I had available to process (sigh). I know Laura. It is a sad tomato year indeed. I’ve only harvested about 10 lbs so far. The rest came from the sunny side of the state. Big Bertha, you had me at hello. I bought a wimpy version at a garage sale, big mistake. Buy them new, as it’s all about the seal. Nice canning pics! Sandy, Big Bertha is indeed impressive, and I would be a little intimated by her as well…But even more dramatic is the color of your kitchen! Now there’s a shade to chase away the winter grays! Bravo! I have a ceramic top range and I’ve been canning on it for the past 7 years no problem. I do have an over sized burner that fits the size of the pressure canner nicely.